Embedded systems must constantly evolve in order to maintain military and aerospace superiority. This mandate means countering new threats, dealing with new constraints, embracing the latest technologies, and developing new architectures. Systems engineers are challenged to conceive and develop new strategies that deliver effective solutions. Only after testing, early adoption, and user validation will the best solutions survive to become industry standards. Traditional open-architecture embedded systems offer flexibility and modularity, so that systems integrators can chose standard boards, backplanes, and chassis from several different vendors to create each application. Extremely successful offerings like VPX and CompactPCI have proven themselves by simplifying upgrades, reducing maintenance, and easing insertion of new technology. Nevertheless, these commercial off-the-shelf (COTS) solutions are often too bulky or expensive for an expanding range of new key applications. To satisfy these needs, a wide range of aptly-named small-form-factor solutions have emerged, many of which are quite effective for specific applications. SFF system enclosures come in all shapes and sizes, with a variety of backplanes, interconnect schemes, circuit board definitions, and environmental specifications. SFF systems are not only smaller than traditional COTS solutions, they are also less expensive, lighter, lower-power, easier to install, and capable of operating in harsh environments – all significant and often critical advantages. Since there are so many of these unique and often proprietary architectures, only a few have been supported by more than a handful of vendors. Even after many years, efforts to standardize them by open-standards bodies VITA and PICMG have been thwarted by relatively thin vendor support and competing alternatives. The promise of an open SFF standard that defines compatible products available from a credible range of long-term suppliers remains elusive. Despite this dearth of widely adopted standards, SFF systems are still attractive to customers for two major reasons. First, the availability of SFF systems with improved size, weight, power, and cost (SWaP-C) metrics opens up new markets and opportunities for critical applications that were previously impractical. Second, the industry recognizes the many benefits of breaking up large, monolithic systems into smaller distributed subsystems, each handling a portion of the system tasks. Several business factors drive make-or-buy decisions for each element for such distributed systems. Customers are increasingly able to justify compact SFF products that do not comply with mainstream open standards for embedded systems because the main portion of the system is a standards-based platform; the SFF subsystems can be thought of as just peripherals. The use of SFF subsystems for distributed architectures enables systems integrators to easily accommodate new requirements for a new opportunity. If the new system has essentially the same signal-processing requirements, but a change in the type and quantity of antennas or sensors, or even a change in the operating environment, the integrator can simply attach a new set of replacement SFF peripherals for a cost-effective redesign. If critical embedded system technology is outside the scope of system integrators’ capabilities, they may not want to invest in developing the engineering skills and expertise needed to design it in-house. A good example is a compact high-speed recording subsystem, capable of acquiring and storing wideband analog or digital output signals for the signal processing system. In other situations, the integrator may simply decide to purchase an SFF solution to reduce risk or time to market, even if the estimated cost to develop it in-house might be a bit lower. An example might be a sensitive radio frequency (RF) receiver small enough to fit within the confines of an unmanned aerial vehicle (UAV). Besides opening up new markets through the many advantages above, SFF solutions can also dramatically boost performance levels by taking advantage of new optical technology. This reality holds especially true when overall system performance is limited by noise or interference at any point in the various signal paths. Prime examples are radar, communications, and telemetry systems with long feed cables to the antennas. Traditional embedded systems integrate processing boards and sensor interface boards within the same system chassis. The sensor interfaces must support analog I/O using RF circuitry and precision data converters to maintain the highest levels of signal fidelity and dynamic range. Isolating and shielding these sensor interfaces from conducted and radiated emissions emanating from adjacent powerful signal processor boards, graphic processors, and switching power supplies often operating at several hundred watts can be extremely challenging. Connecting analog signals to remote antennas or sensors using coaxial cables causes degradation from cable losses and susceptibility to interference from transmitters and power-generation equipment. By combining SFF architectures with optical links, these classic problems can be largely eliminated. Moving the sensor interfaces from the main chassis to SFF subsystems mounted as close as possible to the sensors solves the first problem of system noise contamination. Because sensitive RF circuitry and data converters reside inside the SFF enclosure, the link to the main system is now digital. Although this is a good first step, digital copper cables are still somewhat susceptible to signal degradation from cable loss and interference. These final obstacles are all but eliminated by using digital optical cables, which provide a far superior solution. Fortunately, the embedded community has now standardized optical backplane I/O interfaces for VPX within the VITA 66 Working Group. It adopts existing industry standards for MT optical cables and connectors and new technology for optical transceivers. VITA 66.4 defines housings and connectors for 24 lanes of optical I/O for 3U and 6U VPX modules and mating connectors for backplanes. Optical emitters and detectors located within the modules are connected to gigabit serial pins of an FPGA, which implements a suitable protocol for the required traffic. Figure 1 shows the VITA 66.4 optical backplane circuitry for a 3U VPX FMC carrier, capable of serving as the host interface to a remote SFF system connected by optical cable. Figure 1: The Model 5973 3U VPX Virtex-7 FMC carrier features a VITA 66.4 optical backplane interface supporting 12 Gbytes/s through 24 optical fiber lanes between a remote SFF subsystem and the host. Photo courtesy Pentek. If space permits, this same product can also be integrated within the SFF system. If space is an issue, smaller SFF subsystems can leverage optical interfaces compatible with the cables from the host, even though the SFF chassis may not follow a standard architecture. Digital signals can be easily delivered through these optical cables with baud rates exceeding 12 GHz over distances of hundreds of meters. Because these cables are completely immune to electromagnetic interference, they can run down the antenna mast of a large ship past powerful transmit antennas with no problem. As another significant advantage for aircraft and small UAVs, optical cables are smaller in diameter and much lighter in weight compared to copper. The rugged chassis shown in Figure 2 can be used on many SFF software radio applications because it not only supports coaxial connectors for analog RF I/O, but it also has a circular connector for optical I/O, which can accommodate as many as four MT ferrules, each with as many as 24 optical fibers. To sum up, the host can be a standards-based COTS system using OpenVPX and VITA 66.4, while a standard MT optical cable connects it to the MT optical interface of a remote SFF system, which may or may not follow open architecture standards. Most SFF systems incorporate a processor to manage internal resources and to communicate with the outside world for status and control. 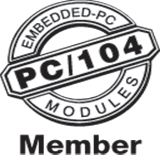 Unless a custom control processor is required, designers have many popular standards to choose from, including Mini-ITX, Com Express, PC/104-Express, and derivatives. Using Intel, ARM, or AMD CPUs, these boards are actually small PCs with various configurations of SDRAM and FLASH memory along with USB and serial ports, PCIe, and SATA interfaces. Figure 2: A rugged SFF enclosure houses sealed 3U VPX conduction-cooled modules with external forced-air heat exchangers. A 38999 circular connector with MT ferrules support optical I/O cables that can connect internally to the Model 5973 in Figure 1. Chassis developed in collaboration with Elma Electronics. Photo courtesy Pentek. Apart from the control processor, the rest of the SFF hardware is driven by the operational requirements. These include analog to digital/digital to analog (A/D and D/A) converters, RF up- and downconverters, power amplifiers, GPS receivers, accelerometers, power meters, video adapters, high-speed Ethernet adapters, optical interfaces, RAID controllers, wireless network adapters, and a long list of others. Many of these peripherals are already equipped with standard system interfaces like PCIe and USB, ready for connection to the system controller. Custom interfaces are usually implemented with FPGAs, which can then bridge the gap to PCIe. Rounding out the system is the power supply, enclosure, mounting provisions, cooling structures, and suitable connectors, all designed for compliance with the deployed environment. The block diagram in Figure 3 shows a remote SFF system for a communications transceiver or radar transponder. It contains a typical system controller plus RF circuitry and wideband data converters, a RAID controller and SSD array for recording, and a 10 GbE optical interface to the host. Figure 3: SFF block diagram with standard PC controller architecture plus specialized peripherals for a wideband RF transceiver, real-time recorder, and a fast optical link to the host system for control, status, and high-speed data. In SFF systems, both Windows and Linux operating systems prevail, with Linux predominating for the smaller and simpler products. A very popular strategy adds a well-defined, high-level application programming interface (API) with underlying function calls and device drivers to handle the various tasks required for a given application. Available Ethernet interfaces allow easy connection to the host computer where users can exploit the API commands quite efficiently to develop custom applications. SFF solutions will play an increasingly significant role in embedded systems, as users realize the many benefits of distributed subsystems. These benefits include higher signal integrity, faster data bandwidths, easier insertion of new technology, higher modularity, and improved reusability of designs. Objections about the lack of industry standards for SFF systems will gradually be allayed by successful deployments and evidence-based performance. Rodger H. Hosking is vice president and cofounder of Pentek, Inc., where he is responsible for new product definition, technology development, and strategic alliances. With more than 30 years in the electronics industry, he has authored hundreds of articles about digital signal processing. Prior to his current position, he served as engineering manager at Wavetek/Rockland. He also holds patents in frequency synthesis and spectrum analysis techniques. Rodger can be contacted at rodger@pentek.com.